The Toronto Blue Jays have dealt all-star third baseman Josh Donaldson to the Cleveland Indians for a player to be named later. The Toronto Blue Jays have sent 2015 American League MVP Josh Donaldson to the Cleveland Indians. The Blue Jays acquired a player to be named later in the trade, the club announced late Friday night. 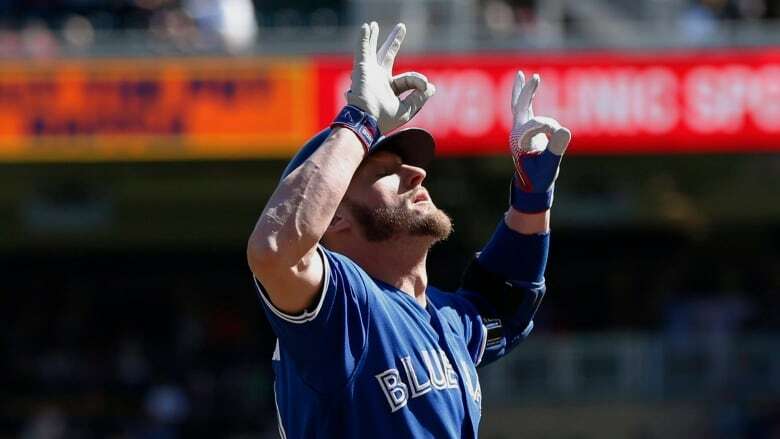 The deal puts an end to a saga between the Blue Jays and the pending free agent that seemed to get uglier the more it progressed past the July 31 non-waiver deadline, with Donaldson stunting his trade value as he languished on the disabled list. Saturday's midnight ET deadline was the cutoff for teams to add players to their roster and still have them be eligible for the post-season. The star third baseman played just 36 games for Toronto this season, batting .234 with five homers, and had been out of action since late May due to a nagging left calf injury. He also missed time at the beginning of the year with a shoulder issue that began at spring training. Donaldson's first step onto the trade block began earlier this week with a rehab assignment at single-A Dunedin. It was significant for the Blue Jays, who needed to prove Donaldson was healthy enough before completing a trade. The 32-year-old homered in his first at-bat for Dunedin Thursday, playing six innings in a game that was originally scheduled for Wednesday but pushed back due to rain. Donaldson was scratched from the initial lineup due to soreness a day after playing five inning in his rehab debut. The deal reunites Donaldson with his former Blue Jays teammate Edwin Encarnacion, who signed with the Indians as a free agent during the 2017 off-season.Cleveland is set to visit Toronto for a four-game series starting next Thursday. Donaldson was acquired by the Blue Jays in a November 2014 deal with Oakland. Canadian Brett Lawrie went to the Athletics in the five-player move that will go down as one of the best trades then-general manager Alex Anthopoulos completed during his tenure in Toronto. After spending parts of four big-league seasons in Oakland, Donaldson had a monster first year with the Blue Jays. He earned the 2015 AL most valuable player award after hitting .297 with 41 homers and 123 RBIs. The native of Pensacola, Fla., also hit 41 doubles and had a .568 slugging percentage to become the first Blue Jay to win the honour since George Bell in 1987. Toronto ended a 22-year playoff drought that fall and reached the American League Championship Series before falling to the Kansas City Royals. Donaldson enjoyed a third straight all-star season in 2016. He hit 37 homers, drove in 99 runs and hit .284 with a .404 on-base percentage to help the Blue Jays return to the ALCS, this time bowing out to the Indians. Donaldson shone during both playoff runs. He belted three homers over 11 games during the 2015 post-season and hit .417 over nine playoff games in 2016 while posting an impressive 1.128 OPS (on-base plus slugging). The six-foot-one, 210-pound slugger was limited in training camp in 2017 due to a calf injury and was slow to find a groove once a six-week stint on the disabled list ended in late May. Once he returned to regular play, Donaldson shone again with 33 homers, 78 RBIs and a .944 OPS in 113 games. Nicknamed the "Bringer of Rain," Donaldson took on a leadership role upon arrival in the Ontario capital. He led by example and wasn't afraid to voice his feelings. When the team was scuffling early in 2015, Donaldson told reporters after a loss that "this isn't the try league, this is the get it done league." The Blue Jays eventually got things done, although they came up a few wins short of a World Series appearance that year and again in 2016. Toronto missed the playoffs in 2017 and are in fourth place in the AL East at 61-73. Before arriving in the big leagues, Donaldson spent three years at Auburn University. He was drafted by the Chicago Cubs as a supplemental first-round pick in 2007. Donaldson made his big-league debut in 2010 and appeared in 14 games over two stints with Oakland. He spent 2011 in the minors and split the 2012 campaign with the Athletics and their triple-A affiliate. Donaldson blossomed in his first full season with Oakland in 2013. He finished fourth in AL MVP voting after hitting .301 with 24 homers and 93 RBIs. He was eighth in the 2014 MVP vote, took 23 of 30 first-place votes in his 2015 victory, and was fourth in the 2016 vote. The Jays also sent outfielder Curtis Granderson to the Milwaukee Brewers for minor leaguer Demi Orimoloye on Friday. Granderson, 37, was hitting .243 with 11 home runs and 35 RBIs in 103 games with the Blue Jays this season. The six-foot-one, 200-pound veteran has put up a .252 average with 330 home runs and 900 RBIs over the course of his 15-year career. He signed a one-year contract worth $5 million US with Toronto in the off-season. Granderson told reporters after the Jays' 6-5 win over the Miami Marlins on Friday that he was looking forward to joining the Brewers, who sit in the final Wild Card spot in the National League at 76-60. "[I was] surprised because you never know what's going to happen you. You hear a lot of rumblings and things, and like I've said before, there's no reason to get worked up about anything until something happens, but then also excited," he said. "Getting a chance to go to a team that has a possibility to get into the playoffs and go deep — I know they've been playing very well from the things I've been seeing, they've also made some other moves — so super excited to join them." Orimoloye, 21, hit five home runs and 23 RBIs with a .260 average in 61 games with the Brewers' Class-A affiliate in Wisconsin, as well as seven home runs and 32 RBIs with a .237 average across 65 games with the Class A-Advanced Carolina Mudcats this season. The six-foot-four, 225-pound outfielder was born in Lagos, Nigeria before moving to Orleans, Ont. He's a graduate of the Canadian National Junior Baseball program.